The aim is to limit global warming to 1.5 C above pre-industrial temperatures; however, there has long been some contention and confusion around what is meant by the targets of 1.5 C and 2 C.
I don't know that anyone will ever agree on what pre-industrial means exactly, which gives a lot of room for inept leaders to wriggle out of their obligations. 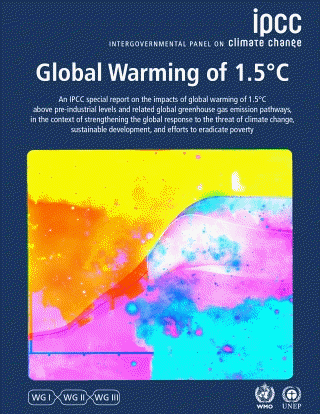 That's why I'm suggesting the IPCC and its member countries set and agree on targets where the meaning is clear, tangible, more precise, and to which people can relate more readily. 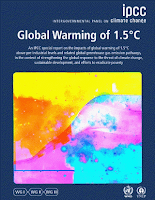 My idea is to change the simple message of 1.5 C or 2 C above pre-industrial to 1 C or 1.5 C above the 1951-1980 mean. 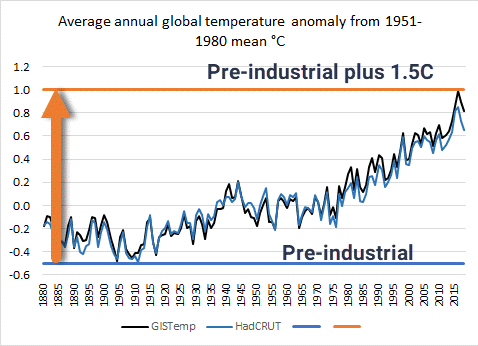 Here's a chart showing GISTemp and HadCRUT, with the current pre-industrial targets superimposed, assuming the pre-industrial baseline is around 0.3C below the temperatures at the turn of the century. This would make them 0.5C below the 1951-1980 mean. Seems to me that setting new targets in terms of an increase above mid 20th century temperatures has many merits. It means only one number is needed, the 1951-1980 mean. People don't have to do calculations using pre-industrial numbers that are iffy in the first place and try to set them against current averages. The data for the 20th century is freely available to all and leaves little room for misinterpretation, unlike "pre-industrial". Many people alive today still remember what the weather was like in the period from 1951 to 1980. In the future, provided civilisation survives, there will be lots of reliable records available from the period. The 30 years from 1951-1980 is not so different to the average of the twentieth century. 1951-1980 was a relatively flat period in terms of temperature deviation (although this may be in part because of the odd spike during WWII, which might not reflect reality). The period is used by NASA, and it's not that hard to adjust other datasets to work out the difference. The new targets would need to be consistent with an estimate of how much atmospheric carbon dioxide we can cope with and still have societies survive in the long run. That's a job for scientists. We therefore recommend that a clear definition of GMST change is agreed, so that mitigation actions required to limit climate change impacts are assessed using self-consistent information. This would prevent apparently contradictory results due to differing interpretations. I suggest changing the messaging to make it clearer. That is, instead of setting a target against the vagueness of pre-industrial, set it against the average of the 1951-1980 global mean. Keep in mind that it's important this message lasts for decades (at least) and is as meaningful in 2080 as it is today. (By 2080 the 39-year-olds born in 1980 will be turning 100 years of age.) It could be set against the WMO's 1961-1980 mean or even against the twentieth century mean. The 1951-1980 might be the best of these, though. Whatever - I'm all for simple messaging. It works with the general public. The longer it's put off, the harder it will be and the more disagreement and indecision it will cause. Do it now. Think of the long term benefits not the short term discomfort. As is obvious, it's not that hard to get a new message out these days, especially if you have a good social media manager with a strong stable of ambassadors and influencers, a PR company, willing journos, and the backing of climate experts and world leaders. As a final note, it's been pointed out to me that there is a lot more to climate change than the annual ups and downs in global temperature. On the other hand, temperature is something people relate to very easily. If they want to explore more they can then look at rainfall, drought, heatwaves, floods, bushfires, sea level rise, melting ice and all the other changes that are happening. What do you think? Is this a silly idea or a sensible move? I know there will be lots of arguments against (causing confusion, the smaller numbers aren't as scary etc.). On the other hand, IMO it would be short term pain for long term gain, or is that wishful thinking? Not that it would be easy to change something as entrenched as the IPCC (or the UN). An alternative but equivalent idea would be to define a conventional "pre-industrial" reference level as (1951-1980) - 0.5C. A bit similar to "before present" referring conventionally to before 1950. Also requires less change in thinking habits. Is it a good idea? It depends on who it is for. For the scientists and policy builders it is a very good idea to standardise the base line so everyone is working from the same figures and within the same framework. Results and conclusions would be more directly comparable. This shows we've almost hit the first target (1.5 C) already and at this rate will exceed it in just a few years. I'll need to check the trend lines, will do that in a future post. Given the Homo Moronic is never going to meet any target my interest would be in predicting future targets that will also not be met and the dates at which those targets will become fashionable. How does the following scheme look? By about that last stage I'd expect any civilised discussion about targets to cease. It just feels like "arranging deckchairs on the Titanic" now. As Jammy Dodger says "blah blah blah"
You people really don't see how futile all this is.... China commissions more new coal fired power stations every fortnight than our entire country has operating now. And to make matters worse... a lot of them are being fueled with Aussie coal. How good is that? You can set whatever arbitrary target you like... it won't change what's happening in the real world. So, what are the per capita emissions in China compared to the US? My impression a couple of years ago, using the BerkeleyEarth data, was that the first half of the 19th century was about 0.4 K lower than the mid-20th century mean. There are other reconstructions that show that the mean global temperature at the beginning of the Industrial Revolution (~1750) was about 0.1 K below the beginning of the 19th century. In my head I've always added this increment to any reference to the mid-20th century baseline in acknowledgement of the initial warming resulting from the early use of coal, and of large-scale deforestation for timber ships, housing, and agriculture. Anyway, the point is that I would go with Martin's suggestion as it provides a simple reference to the easily-used 20th century baseline, whilst also easily incorporating the full amount of warming realised by human carbon emissions over the last few hundred years. It's important to fix the baselines solidly because governments of all persuasions (especially the science-denying conservative Australian ones) are vigorously predisposed to continually shifting their reference periods forward when they develop new policies. We have to stop this, because we're running out of room to accomplish any worthwhile mitigation. Even then it will be ugly, but if we think for a moment that we can keep putting it off to the future, all that we're doing is wilfully denying the fact that with our current inaction we're signing the death warrants of our decendants and the global ecosystems in which they would have lived. If we want to pretend to being an advanced species we cannot continue down that path. Another way to find the " preindustrial" temperatures is to extrapolate the function of temperature vs log CO2 back to a preindustrial level of CO2, e g 280 ppm. I did the following chart almost a year ago, but I don't think it will change much with 2018 included. The chart includes a "best fit" 14 years lag, to account for commited warming, but the lower end (-0.45 C at 280 ppm) is very robust and will only change by 0.01 C if the lag is set to zero. It looks like Gistemp loti will pass 1.5 C above preindustrial before 2030 (or 1.05 C above 1951-1980 avg). Another prediction is that climate sensitivity, the temperature when the atmospheric CO2-content is doubled, is around 3C, but I guess you have heard that before..
And in the latest news regarding denialist trashing of the planet, Trump appoints John Christie to the board of the EPA. That's like appointing Stephen Arroyo to run NASA. I think that the ideas that you have discussed in this article, make good sense. Pre-industrial is too vague, and leaves too much wriggle room. I prefer the target being above the 1951-1980 mean. It makes global warming a "recent" phenomenon. This stops arguments about the warming from 1910 to 1940 (was it natural, or caused by humans). There is a danger in setting the target too low. If people have little possibility of meeting the target, then they will ignore it. But you shouldn't listen to what I say. Because I am just a Denier. Off topic: but very topical. Trump has announced a red team to be led by William Happer. I would note that if Trump has to use a 79 year old to deny the future impact of climate change, that future cannot be very far off. Apologies for using this thread as a platform for speaking to a denier, Sou, but I'm fed up with the necessary brevity of Twitter and I want to make a point, and the target is a Plimer-esque geologist (why is it always the geologists?) so it's within the purview of HotWhopper. It is apparent that many people have no operational understanding of what acids and bases are. For a start, there are at least four definitions of the term ‘acid’, and thus they may be categorised as Arrhenius acids, as Lowry-Brønsted acids, as solvent-system acids or as Lewis acids. The first two definitions are most pertinent to the issue of sea-water acidification, because they pertain to the increase in the hydrogen ions that cause ocean acidity. An Arrhenius acid is a substance that increases the concentration of hydrogen ions (protons: H⁺) in a solution. In water these protons are present as hydronium ions (H₃O⁺) and so the two identities tend to be used interchangeably, if somewhat inaccurately. Bases are substances that increase the concentration of hydroxide ions (OH⁻). A Lowry-Brønsted acid is a proton (H⁺) donor and a Lowry-Brønsted base is a proton acceptor. In these contexts any circumstance that increases the concentration in solution of the definitive cation is ACIDIFICATION. It is as simple as that. The classic “an acid is… blah blah… pH below 7” definition is largely an arbitrary one, with a pH chosen to be ‘neutral’ by reference to pure water at a particular temperature, where the number of H⁺ ions equals the number of OH⁻ ions. This is merely a reference point, and it has no bearing on the fact that in going from pH 9 to pH 5 the concentration of H+ is INCREASING, and the concentration of OH⁻ is similarly decreasing. And vice versa for a pH change in then opposite direction. For many chemical and biochemical equilibria neutrality is an irrelevance in a continuum of hydrogen cation concentration. In these two definitions an acid per se is a solution that has more hydrogen ions than hydroxl ions, but the term ‘acidification’ is always considered relative to a starting concentration of hydrogen ions, and not to the ‘neutral’ point. Using the (il)logic of some on this thread the process of going to pH 5 from pH 6 is ‘acidification’ but going from pH 9 from pH 8 is not, even though in both cases the concentration of hydrogen ions has increased by one order of magnitude. For those who are unaware, the pH scale is the negative base 10 logarithm of the hydrogen ion concentration. At pH 8.1 the concentration of hydrogen cations is about 7.94×10⁻⁹ mol/L: that is, 7.9 billionths of 1mol/L. A pH of 8.0 is 10⁻⁸ mol/L hydrogen ions, or about 25% more than occurs at pH 8.1. This is a difference of 2 billionths of 1 mol/L. This is not much, is it? Except it is, if you are an organism living in an exquisitely pH-sensitive milieu, such as occurs in carbonate cycling or in acid osmosis. I rather suspect that some of the blusterers here have no idea of the biochemistry of energy production and transport through a cell, or they would be rather less cavalier about dismissing the significance of ACIDITY (yes, even above pH 7.0) in biological systems. What I probably didn't make as clear as I could have in post #11 is that under other conditions it is quite possible to have a pH value greater than 7, and yet have a solution that has a surfeit of hydronium ions over hydroxide ions. Such a solution will thus technically be ‘acidic’, and this even with a pH greater than the arbitrary 7 that ocean-acidification deniers claim is required to be passed before the solution can be defined as being "acid" or "acidifying". 4) Reduced concentration of calcium carbonate in solution results in calcifers either not being able to maintain their calcium skeletons, or not being able to create them in the first place. 5) increased H⁺/H₃O⁺ in solution has other proton-gradient/osmotic effects on sea life, ranging from the ability of fish to smell to the capacity of eggs and embryos to develop. So... the oceans are acidifying as a result of humans pumping CO₂ into the atmosphere, and the increased acidity is having profound consequences for sea species. These sequelæ are an inescapable fact. There are more replies by me to other posts from this revamp of Plimer, but in its usual fashion Twitter has buried the trail. It's curious though that Fagan paid to have his tweet put onto climate acitivists' pages - he seems to come from the Curry/Nova stable of deniers, with a fawning hat-tip to Bolt. Bernard, you need to stop taking those acid trips... that stuff will really fry your brain. Skeptikal (cough) - if you have an issue with any substantive point I have made about the science do share. Otherwise your contribution is nothing more than pointing at squirrels, and imaginary ones at that. A reminder, Skeptical. This blog is not the place for posting your weird fantasies. Specifically, "no disinformation will be permitted. Such comments will be deleted." See the HotWhopper comment policy. Oh, I missed Skeptical's response. Still missing Sou's skewering of loonisphere. I hope you are soon able to return to the fray.